Britney Spears was born December 2, 1981 at 1:30 AM CST (+6:00) in McComb, MT (31 N 14 / 90 W 27) (source: AstroDatabank, Rodden Rating A). However, we sometimes find the birth place of Kentwood, Louisiana, USA (33 N 45 / 84 W 23) too. When assessing a horoscope, we always look at the standouts, things that are missing and things that are, on the contrary, overly present, items that are out of balance. Not to overwhelm you with information, we will only assess the horoscope of Britney Spears by looking at the factors that only have some meaning for her love life. a strong 1st Quadrant (7 of the 10 planets/Lights can be found in the houses 1 to 3, called the 1st Quadrant). Uranus at 0° Sagittarius on a 'critical' degree. some very close aspects: Venus opposite Moon's Node, Mars square Neptune, Venus square Pluto and the Sun semi-square Pluto. A strong first Quadrant always means that the native (i.c. Britney Spears) has a lot of will-power and is self-sufficient. The first Quadrant is about the SELF (the second Quadrant -- houses 4 to 6 -- is about the FAMILY, the third about the PARTNER and SOCIALIZING and the fourth about the SOCIETY). Any planet at 0° in any sign, shows a new beginning. 0° Sagittarius is quite a positive (and very public) degree. Mostly it denotes fortunate developments, power and renown. Uranus too, is quite a public planet. A Mars-Neptune square shows a lack of energy and an aversion to or dissatisfaction with the work as well. Venus (ruler of the first house) in an exact square to Pluto makes very sensual, at times even lustful and denotes sexual urges that are not always under control. A lot of physical changes (different looks) are indicated too. 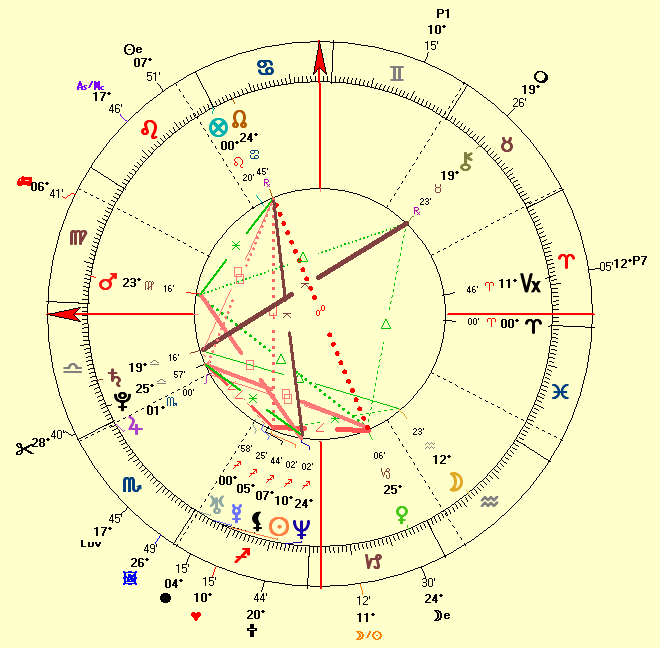 The Sun-Pluto aspect too is such a powerful configuration showing some power struggles in the life of Britney Spears. Venus (ruler of the first house) exactly opposite the Moon's Node has to do with leave-taking, separation from beloved ones. When a planet is in the same degree as the North Node, matters can become critical. There may be a crisis. Considering the Node and Neptune act together on the same degree, we get a misty and disappointing combination. Neptune always dissolves the bonds that the North Node wants to make. Connections (Moon's Node) are hidden or kept secret (Neptune). Neptune brings a lot of confusion, (dis)illusion, misunderstanding or intrigue to the connections of Britney Spears. We have not rectified the horoscope of Britney Spears, as we have no life events that could be used. As you can see, Britney Spears will have a marvelous 2004, being more popular than ever. Her love life will start to blossom (again). In 2004, Britney Spears is said to be engaged to marry her dancer-boyfriend Kevin Federline. News of the engagement was confirmed by Spears' personal publicist and her label, Jive Records -- click here to take a look at the wedding and marriage horoscopes of Britney Spears --. How will Britney Spears fare according to Astrodamus? Update June 2004: Britney Spears is said to be engaged to marry her dancer-boyfriend Kevin Federline. News of the engagement was confirmed by Spears' personal publicist and her label, Jive Records -- click here to take a look at the different 2004 wedding and marriage horoscopes of Britneys Spears). Update April 14, 2005: Britney Spears officially announced her pregnancy April 12, 2005 on her web site. Rumours go it will be a girl, however we predict it will be a boy. According to our calculations the baby will be delivered around October 2, 2005. More information and details will be published in our Issue #005 of our monthly Love Letter. Why don't you sign up to our Love Letter? It's FREE. Update September 15, 2005: Us Weekly magazine reports that Britney gave birth by Caesarean section shortly before 1 p.m. PDT (1700 GMT) at Santa Monica UCLA Medical Center, California on Wednesday September 14, 2005. Update June 2006: Britney Spears confirmed on May 9, 2006 that she's pregnant again. Update October 2006: Britney Spears reportedly gave birth to another baby boy via (a scheduled) Caesarean section at a Los Angeles hospital just before 2 a.m. on Tuesday, September 12, 2006. Update December 16, 2011: It is confirmed that Britney Spears is engaged with her former agent, Jason Trawick since December 15. The pair has been together since early 2009. Update January 11, 2013: Britney Spears has announced her breakup and one-year engagement with Jason Trawick. They intend to remain friends.